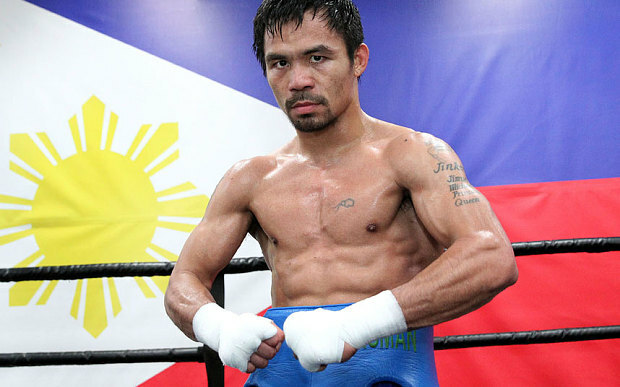 Ring News 24Boxing News Breaking Boxing NewsIs Manny Pacquiao vs. Vasyl Lomachenko a realistic possibility for April? Is Manny Pacquiao vs. Vasyl Lomachenko a realistic possibility for April? As 2018 moves on, the surprises, or at the very least, rumors, continue to come in. One of them being a possible switch with the potential show on April 21 featuring former lineal junior welterweight champion Terence Crawford moving up in weight to challenge WBO welterweight champion Jeff Horn in Las Vegas. It looks like the Horn vs. Crawford fight could now be switched to a co-main event, likely to land on ESPN due to Top Rank’s contract with them, and that the headlining act likely will be eight-division world champion Manny Pacquiao instead. Pacquiao has yet to fight since his July upset loss to Horn, where he traveled overseas into his opponent’s native Australia, only to drop a hotly-contested unanimous decision loss. Having turned 39 years old recently, there is still plenty of fight left inside of the Filipino icon, but it’s his rumored return opponent who people could be surprised to see. Looks as though Pacquiao very well could be facing off with WBO junior lightweight champion Vasyl Lomachenko, who is regarded as one of the sport’s best fighters. Many pundits have Lomachenko, 29, rated as the games best, and he is coming off of a wave of dominant performances over former champions such as Guillermo Rigondeaux, Jason Sosa, Nicholas Walters, and Roman “Rocky” Martinez. There is a little bit of weight disparity between the two men, as Pacquiao has been actively campaigning as a welterweight, yet still no reason to think that a catch weight can’t be secured. It’s very unlikely that Many can drop to the lightweight limit, but perhaps something between 138-140 pounds could be feasible. And what about the matchup itself? How would a Pacquiao vs. Lomachenko dream fight play out? That’s still a bit hard to gauge at this point. First off, you have to take a look at each man’s career and where they are out. Sure, Lomachenko has been victorious lately, but some of his opponents (Rigondeaux, Miguel Marriaga) have been undersized. Lomachenko was very dominant over Guillermo Rigondeaux, who he forced to remain on his stool following the sixth round of their fight last month, but it should be noted that the size disparity between the two men was very noticeable. Pacquiao certainly isn’t the fighter who shocked the sport just years back but rising in weight to secure victories over the likes of Oscar De La Hoya, Ricky Hatton, Miguel Cotto, Joshua Clottey, Antonio, Margarito, Shane Mosley, and others, yet he is still a force to be reckoned with. All one has to do to realize that is take a look back to Pacquiao’s match prior to Horn, where he handily defeated former two-division champion Jessie Vargas via decision in Las Vegas. Top Rank promoter Bob Arum surely knows that he will have to stage some entertaining, high-profile matches for his partnership with ESPN to work and he appears to be doing just that. Crawford vs. Horn is interesting, but adding Pacquiao vs. Lomachenko raises the bar. Now let’s see if there is some substance behind the rumors. Will Adonis Stevenson continue to avoid Sergey Kovalev? Can Scott Quigg withstand Oscar Valdez’s power and win in USA?